There is a palpable freshness about this exciting and eclectic programme. Every composer brings his own harmonic and melodic palette to the table. Words alone cannot begin to describe the emotional and dramatic content of this outstanding programme. The climax comes in the form of the Stations of the Cross. A creation sans pareil, it feels so spontaneous. It’s good to meet a more substantial work by Thomas Hewitt Jones. Many of us will know the plangent What Child Is This at the end of Carols for Choirs 5. David Briggs needs no introduction. His lush Berceuse is a charming foil to his outspoken Toccata. Former Director of Music at Keble, Simon Whalley wrote the Festal Paean to show off the myriad colours of the new organ. David Bednall is no stranger to larger forms, and clearly enjoys every aspect of a well-stocked instrument. The work received its première in St Paul’s Cathedral. I love Philip Moore’s writing. He always has something fresh to say. Neil Cox’s composition is a response to the Chagall window in Chichester Cathedral which depicts Psalm 150. The climax of the programme, as if we haven’t had many already, is John Hosking’s most apposite response to the 14 Stations of the Cross. 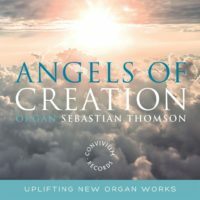 None of this, of course, would be possible without the breath-taking input of the stunning organist, Sebastian Thomson, about whom we should know and hear much more! Organists’ Review is the leading magazine for all lovers of the organ and its music. It provides a kaleidoscope of the organ world, with articles, information and stunning pictures covering a wide range of organ related topics. In addition to regular features such as new music and CD reviews, each issue explores in depth a theme of current interest.